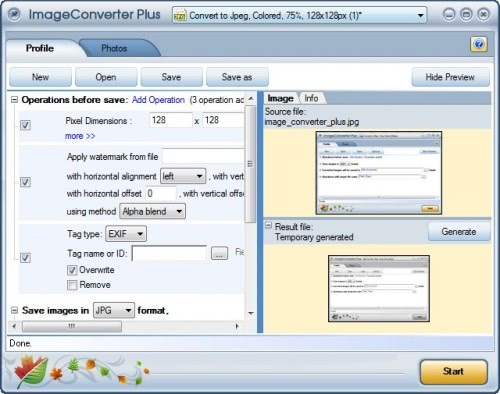 Image Converter Plus is a professional image converter for the Windows operating system that supports a large amount of different image formats including popular formats like jpg or png but also lesser used formats like raw image formats from various digital cameras and even Adobe Photoshop pdf files. The main interface of the program is divided into a profile and photos section. The program uses conversion profiles to convert the photos and images that are loaded into it. About a dozen profiles are already available after installation ranging from converting photos to jpeg thumbnails, true color png images or black and white tiff images. Each profile consists of a set of operations, a target image format, a folder where the converted images are saved and file name manipulations. The option to create new profiles and alter existing ones is a very powerful way of configuring photo converting operations that need to be processed regularly. All it actually takes to convert photos with a specific profile would be to load the photos, select the profile and hit the start button in the software. The most powerful part are the operations that can be added to each profile. It is possible to add one or multiple operations to the profile which ranges from resizing and rotating images to adding watermarks, color effects or profiles, page filters or brightness and contrast changes. The strength of this is the ability to use multiple image converting and manipulation operations. It is for example possible to reduce all loaded photos by 50%, add a watermark image to the lower left using alpha blend and remove meta tags if those are stored in the original photos. The program comes with a preview option to preview the profiles before they are saved and used. 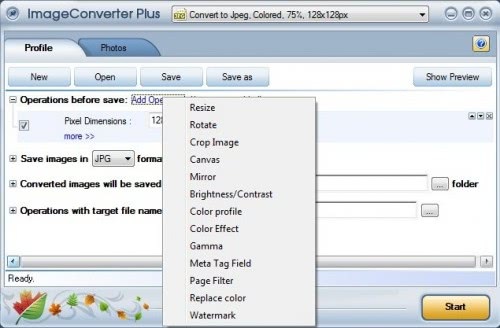 Image Converter Plus supports batch conversion of images that are loaded into the interface. It is actually possible to load images or folders containing images into the application. The photo tab will display all photos and images that have been loaded into the program. Each image conversion can be previewed individually before all images are converted using the settings of the selected profile. Another interesting option for professional use is command line support so that the program can be used in batch files. Image Converter Plus is a very powerful image converter that supports lots of image formats and operations that can enhance, change and convert images into an output format the user wants it to be in. The use of profiles make the image conversions less time consuming after the first initial configuration. That could be very useful to prepare images to be added on my sites! 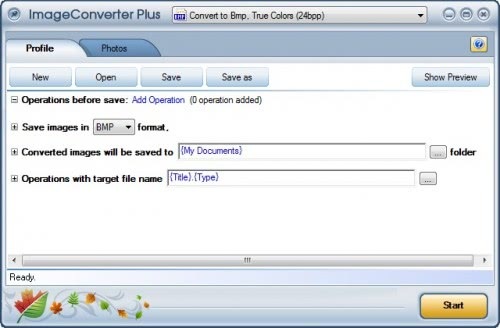 Image Converter Plus a useful soft for batch converting. I like also Image Converter with batch converting. I would like to try converting image from pdf file. This would be immensely helpful in converting photos to upload on my site or to add in my power point presentations. Hope I get it. I like this software. It will help when converting multiple photos. Thanks for all the great prizes in this Christmas Giveaway. I need to convert various photos with quality results. Please include me. Thanks! This is great for managing the conversion of festivities pictures. I really like to use this program to reduce all main loaded photos and to add watermarks to them. I use SnagIt to convert picture or add watermark on it. But since my old SnagIt doesn’t support batch processing, this Image Converter Plus can be a companion for my pictures job. I often need to convert family pictures to different format or different size for sending them over the web. A nice utility to make it easy is awesome. It’s just a very useful tool ! I like to use this to convert pic and use the enhancers this software does.Pls consider me. Thanks. Would like this to make thumbnails and other fx that it has so i would like one. My name pls. Very useful as I take a lot of pictures. Thanks a million! I’d love to use this software. I’ve been stuck using Adobe Photoshop’s batch conversion which is alright, but lacking. Thanks! Thanks a lot for the efforts. I am in to try my fortune. I WANT TO CONVERT MANY IMAGES IN MY SYSTEM TO VARIOUS FORMATS FOR PRINT OUTS. I HOPE TO WIN THIS. i tried many image converters, but i am not satisfied. but this looks like it has all the features i want in a image converter. lucky if i got it. Another winner it seems. I’m in for the draw. With this software, I can easily manage my RAW files for updating my portfolio. The ability to reduce the size would be a huge disk space saver. The ability to watermark batches of photos would come in handy to save time. It irks me to watermark photos one by one. Nice giveaway. I would like to win. it like to use it for resizing my pic to put them on the internet. Hey, seems to be a really good software !!! Thank you, Ghacks and fCoder Group !!! I seem to constantly be changing camera, computer and software – would be good to be able to convert things to have some level of consistency and to use for any purpose. Merry Christmas! I had it for a while as the giveawayoftheday, but sadly I had to reformat the pc and lost it. This is a great contest. I really like this and it would be of great help if I can win one license. Thank you, I hope to win a license for the Image Converter in this giveaway promo. I need it to replace my outmoded way of going through a full-size image editor which in my case is Irfanview. I’d like to use it to convert images without opening then and saving them again. Thanks! I need a program to watermark images. This looks like it would work well. To convert to send pictures to friends and family over the web. would be glad if i can convert file formats of pictures, would be glad if the quality is not lost, would be glad if I grab this. I colud do with this one as my kid has just started a course in photography,and i am sure she would love this. I like the right click fast converting features. thank you so much for the license for this wonderful programm! that would make be able to handle fotos at different ways. I would be great to the soft.